I Need a Practical and Environmentally Friendly Car That Doesn't Send the Wrong Message! What Car Should I Buy? Thomas is an architect in the midwest looking for a comfortable crossover that can haul his two boys, have a reasonable carbon footprint, and not send the wrong message to his potential clients. What car should he buy? I’m a residential architect. My job is to design people’s homes. So much of what I drive every day is dictated by my professional image. My car cannot be better than my clients, it should be American so as not to inadvertently cause offense, and as an architect, I feel compelled to drive something that’s good for the environment. On a personal level, I am also a father of two boys ages 6 and 4 and always have a row of car seats installed. To that end, a third row is desirable, as is lots of cargo space. I live in Missouri, so something that handles in rain and snow is good as well. Presently, I drive a 2014 Ford Explorer Sport. I have loved the car, except for its terrible gas mileage. I especially like the power I get from the ironically labeled “EcoBoost” system. I’m looking for a car with some luxury features, but not too fancy, decent fuel economy, and three rows. My maximum budget is $50,000. Thomas—that’s a good, strong name—I’m going to be straight with you here. Most people don’t really care what you drive. In fact, most people don’t even notice. Now if you were to roll up in a Rolls Royce or a Bugatti that is another story, but the vast majority of normal cars barely get a glance. And I don’t think people who hire architects generally judge the potential quality of their work based on the car they own, though in hindsight the architect I used for my house had a Jeep Liberty and that experience was not awesome. Long as you’re in something reasonably nice, practical and clean you’ll be fine. I think you just buy yourself a Toyota Highlander Hybrid. Despite the badge, it is an “American” car. It’s made in Princeton, Indiana which is about two and a half hours from you. This vehicle’s popularity and production literally employs other midwesterners. And I just can’t imagine in what universe someone would be “inadvertently offended” by a Toyota Highlander. The Highlander checks all your boxes, it’s comfortable, reliable, has three rows of seats a Limited or Platinum trim will give you features you would find in most luxury cars yet certainly would not be perceived as “too fancy.” If you opt for the hybrid you could achieve up to 30 mpg in the city and 28 mpg on the highway. Here is a new one that is well loaded for under your budget. Perhaps folks in St. Louis are judgier than I expect, but I think you will be just fine. One thing I’ll say to start, Tom—I wouldn’t worry about a “non-American” car “causing offense” these days, since scores of Hondas, Toyotas and BMWs are made in the U.S. and tons of traditional American companies are shipping manufacturing jobs overseas. Buy what you want and don’t let that deter you. I’d love to tell you to just go full electric and get a Chevrolet Bolt, a car that was my biggest surprise in 2018 and something I think very highly of. It’s American, it’s practical, it doesn’t have carbon emissions at all and it’s more fun than you might expect. But it definitely doesn’t have a third row, so it may be too small for your needs. Three-row hybrid SUVs are in short supply across the board, something I think you can blame cheap gas for. You like your Explorer, though. So maybe hold out for the new 2020 Explorer Hybrid due out later this year. Its 3.3-liter V6 hybrid powertrain is apparently good for 500 miles of range. It’s not out yet, but I’m sure you could get one for under $50,000 when it drops. And if you decide to embrace cheap gas and get the ostensibly more fun Explorer ST instead, we at Jalopnik certainly will not judge you. Expert 3: Raphael Orlove - $50,000 For An Eco Car? The good architect in the town I grew up was exceedingly nice, charming, and beloved by all. He drove a Citroën 2CV, red like a firetruck. Now, if I were you, I would also go looking for an old Citroën wagon, like a three-row DS Break or Safari, but I had a hard time finding one for sale in the country, let alone near you. Plenty of vintage American station wagons and VW Westfalia vans, but few French machines. However, there is this lovely old vintage Land Rover longroof with the wonderful sideways-facing rear seats. It is more than within your budget, and shows you have a sense of timeless style, as well as a good idea of what quality old things that can be re-used. What’s more eco than that? Size and economy is always a difficult equation to reconcile since, you know, bigger vehicles have bigger appetites for fuel. But my colleagues have given you some good tips here. Well, two of them anyway. I was about to suggest a Subaru Ascent or Honda Pilot, both of which are American-made three-row vehicles you could afford that don’t guzzle gas. But then I realized that the base 2019 Volvo XC90 fits your budget, barely, and is supposed to be able to get MPG better than the Honda or Subaru on the highway. 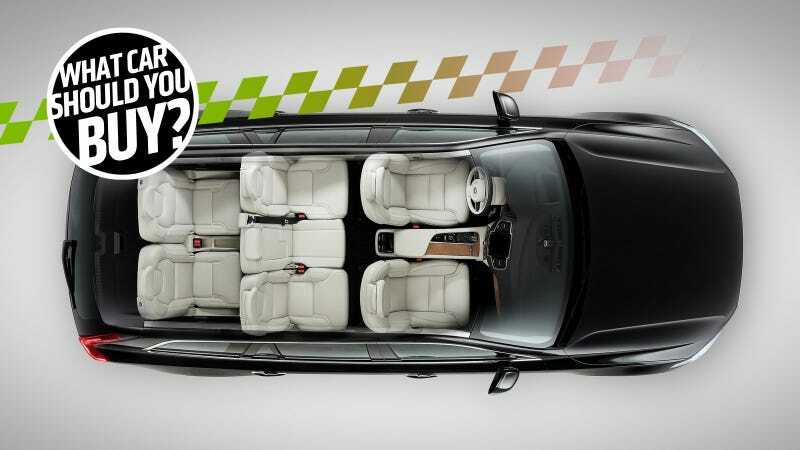 So with a $47,700 list price, a 2019 Volvo XC90 T5 Momentum FWD might be cutting it close for you financially. But as an architect, I imagine you might have an elevated appreciation for design. And the cockpit of a new Volvo provides aesthetic satisfaction that a lot of other modern cars can’t match. And while it is decidedly a luxury vehicle, the Volvo brand doesn’t seem to carry the pretensions of a BMW or Mercedes as far as your image goes. Unfortunately, you’re going to have to pay extra if you want any color other than white.